Designed for a French client from New Caledonia, this powercat was requested for private lagoon and open sea use. 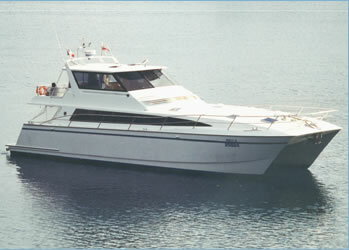 Offshore cruising speed required was 10 to 12 knots with a high degree of fuel economy, while lagoon speed was also wanted. All parameters were successfully met with a chined displacement hull shape proving to be correct. The owners have been satisfied with comfort aboard. This craft has covered more than 50,000 nautical miles at time of writing and longest voyage so far has been from New Caledonia to Tahiti to Marquesas, then return.